Bryan Noyce has over 12 years experience and is a graduate of the San Diego Golf Academy where he received a degree in Business and Golf Management and Certification in advanced teaching, custom club fitting and club making. Bryan has a wealth of experience teaching golfers of all ages. He specializes in the creation and coordination of junior camps and began a junior program at Shadowridge Country Club in Vista, CA and was also the head instructor for the Georgia Junior Golf Program. His students have gone on to compete in the Junior World Championship, medal in the Special Olympics, receive college scholarships in golf, and become all-state high school golfers. 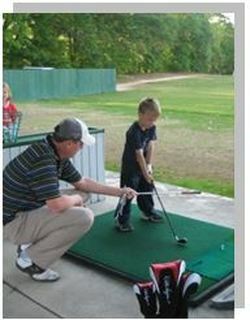 Bryan holds lessons, camps and leagues at The Hooch Golf Club in Duluth GA. Whether a seasoned golfer looking to improve your game or a first time golfer wanting to learn the basic fundamentals of golf, Bryan's lessons are tailored to suit your individual needs. @2017, All Right Reserved. NoyceSwing.com.